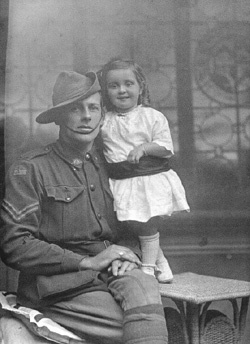 This is my mother with her uncle Bill Sweetland after his return from World War One. Contracted enteric fever and pneumonia, Gallipoli, 30 October 1915; invalided to Gibraltar; returned to duty, 3 June 1916. Wounded in action, Mouquet Farm, Pozieres, France, 21 August 1916; invalided to Paris Plage Hospital, thence to 3rd Auxiliary Hospital, Dartford, England. Disembarked Australia, 2 April 1917; discharged (medically unfit), 11 June 1917.